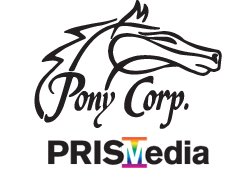 Pony Corporation is a commercial offset printer with silk-screen and digital printing capabilities. The company has grown from its beginning in 1980 with three employees, to a top quality printing company now employing 23 employees. This business growth is a result of talented employees working together to produce a finished product that meets and exceeds the customers expectations on a consistent basis. Because of our high standards and resulting customer satisfaction, our customers come back to us for their continued printing needs.